Weekly roundup – 13 brand new and noteworthy iOS 8.4 jailbreak tweaks released for this week. 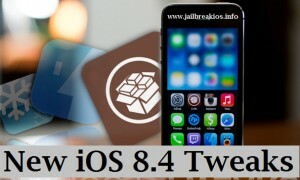 As you know that iOS 8.4 through iOS 8.1.3 firmware currently jailbroken by TaiG jailbreak. So we know that all cydia lovers are always waiting to gain new jailbreak tweaks, apps, themes, modes, games and more. We glad to say you brand new 13 jailbreak tweaks updated for you. If you did not install cydia on your iPhone, iPad or iPod touch yet, then we invite you to jailbreak your idevice and take those new jailbreak tweaks your idevice also through the cydia. Note : If you are thinking to jailbreak iOS 8.4 idevice on windows OS, download TaiG v2.4.3 interface. Otherwise if you choose on Mac, then download TaiG v1.1.0. All taig jailbreak implements can download from the TaiG’s web page for free. Safe mode can disable on lock screen. Disable screenshot notification on timed photos or messages. Hide “is writing a message…” notification. Disable Ads on from displaying on BBM. You can see the incoming calls as a banner at the top of your idevice screen. It will supply a floating web browser window. It lets you to view the web from anywhere. ColorFlow 2 allows to colorizes iOS 8.4 now playing interface with the album artwork. ColorFlow 2 is the priced tweak. You should pay $1.99 to take it. You can colourlize lockscreen and music app using Colourize. The tweak allows to hide searches in the Safari’ s history. No need to pay for SafariSearchHider. Includes a rotating globe for your idevice lock screen. Earth Lockscreen free for you. You can dismiss the volume HUD much faster. Disables search history and browsing history. It is free for you. You can download or share instragram post as well as zoom into them using InstaTool. Keek allows tp tale glance at your apps from control center. $1.99 should pay for gain it on your idevice. You can enable AirPlay in beIN sports app. Free for download. If you need to know additional information about brand new daily updating jailbreak tweaks, then stay with us along. Typecast is a new release jailbreak tweak that makes “now typing” indicator and receipt indicators join with message conversations. It will be especially good when juggling multiple conversations the the same time, because Typecast places inside the message list view. TypeStatus, a similar jailbreak tweak to Typecast. 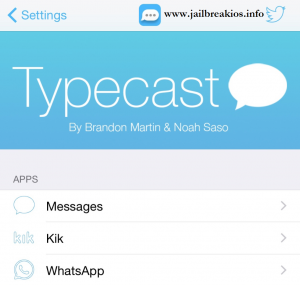 The new tweak of Typecast works with additional applications like WhatsApp,s Stock Messages app and kik. According to Typecast terms we seem that typecast stand out and provide better presentation than the TypeStatus tweak. Now all of you can download Typecast and install on your idevice, it is currently available on $1.49. Furthermore the new tweak will allow you to manage your chatting experience with professional manner. However now you can join with the Typecast. We invite all of you to enjoy with Typecast. When you installed typecast on your jailbroken idevice its’ preference panel can find head over to the stock iOS settings app. There are 3 sections available inside of the preferences. All the above panels let you to enable status indicators of the conversation list, when someone’s typing you can appear on the app icon badge and hide the typing badge. You can change the read receipt glyph position and typing status bar glyph position. However now you can enjoy with the new jailbreak tweak of Typecast. Beam (Free) : You can hide the battery icon in the status bar. ChargePulse (Free) : Pulsing effect provide to the status bar battery icon while charging. Minimal HUD (Free) : Working as the alternative volume HUD for iOS 8. LinkCollector ($1.49) : Delay opening links in Safari. BIM (Free) : Browse the web using the Message app. Prism ($1.5) : Visualizer to the iOS 8.4 music app. SystemWide ($0.99) : Customize the iOS UI elements colors. VideoLoop (Free) : Loop in camera roll views. QuickDictation (Free) : Replace audio message button in message using dictation. WAEnhancerLite8 (Free) : Additional new features to WhatsApp. PasscodeLockViewPlus8 ($1.50) : You can customize Passcode view in lock screen. ShiftCycle (Free) : Change the selected text case with iOS keyboard’s Shift key. WARecentsUpdates (Free) : Display list of status updates and profile image. Segue (Free) : Photo slideshow transitions to the stock photos app.